A customer brought in this lamp the other day and said the socket would not stay on. It would flash on and go off again. While testing the socket we noted the socket issue. Keyed sockets have a faceted plate on the shaft of the key. That plate has a geometric shape to close the circuit in one position for on and open the circuit in another position for off. The interior of this socket had a worn plate and it would not keep the circuit closed. This is an easy fix; we will need to replace the lamp socket interior. First make sure the lamp is unplugged. Then remove the chimney, shade and anything else from the lamp that could be damaged. Using some needle nose pliers or our favorite tool, hemostat clamps, hold the socket mandrel and unscrew the socket key from the key shaft. Move to the bottom of the lamp. Push some cord slack from the lamp cord through the base and out the bottom. 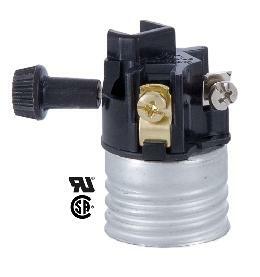 The with a slim flat head screw driver, pry the socket shell from the socket cap. With the slack in the bottom of the lamp you can pull the socket up and unscrew the lamp wire from the socket terminals. Remember to keep the UL Knot intact. If the lamp does not have a UL knot, this is the time to do it. Also if the lamp is loose, this is the time to tighten the bottom nut of the base to the socket without twisting the wire in the lamp. Using the steps in reverse you can attach the new socket interior to the lamp cord, pull out the slack, attach the key, and snap in the socket shell to the socket cap. The results are a renewed lamp to enjoy and an upcycled project complete.